North Korea has endorsed the Sino-Russian double-freeze peace plan in all but name. Because Washington refuses to entertain the double-freeze, the US remains the biggest stumbling bloc to negotiations. North Korea’s Foreign Minister, Ri Yong-ho, has spoken exclusively to TASS on the occasion of the 69th anniversary of the establishment of diplomatic relations between Pyongyang and Moscow. “Tomorrow, October 12, will mark the 69th anniversary of the establishment of diplomatic relations between the DPRK and Russia and in this connection I would like to express the hope that friendship and cooperation between our peoples will be growing stronger and that the strategic importance of interaction will grow with the passage of time. My country today is attaining a victory and acting as a worthy counterbalance to the United States, which refers to itself as the “only superpower.” I believe that having such a strong neighbor by its side quite agrees with Russia’s interests. Lately, Korean-Russian relations have been not at the desirable level due to internal and external factors and a number of difficulties and obstacles, but we are optimistic about their potential and their prospects, because there is a solid groundwork for the development of bilateral relations, resting upon a long history of friendship and cooperation. The United States these days is conducting a policy of sanctions against both countries – the DPRK and Russia, trying at the same time to make Russia join the campaign of sanctions against the DPRK with the aim of breeding discord between our countries. I hope that TASS will make all Russians aware of how absurd this policy is and thereby promote stronger friendship between our peoples and peace and security in this region. I am certain that the leadership and people of Russia will overcome all challenges and difficulties and that Russia will rise again and regain the strength of a great power. By his belligerent and insane statement at the United Nations Trump, so to say, lighted the fuse of war against us. Esteemed Supreme Leader Kim Jong-un earlier issued a stern warning: the United States must act sensibly and stop troubling us, if it does not want to be disgraced before the eyes of the world by exposing itself to our strike. He said that our strategic forces, possessing inexhaustible strength not yet known to anyone, will not let America, an aggressor state, go unpunished. Now it is the United States’ turn to pay, and all of our military servicemen and our entire people insistently demand that final scores be settled with the Americans only with a hail of fire, and not with words. We have nearly achieved the final point on the way to our ultimate goal, to achieving a real balance of force with the United States. Our nuclear weapons will never be a subject matter of negotiations as long as the United States’ policy of pressure on the DPRK has not been uprooted once and for all. At the 2nd plenary meeting of the 7thcomposition of the Central Committee of the Workers’ Party of Korea the Esteemed Supreme Leader said once again that our nuclear weapons are a result of sanguinary struggle for protecting the destiny and sovereignty of our Motherland from American nuclear threats, that it is a deterrent that guarantees peace and security in the region and the right of the Korean nation to existence and development, that it is a sacramental sword of justice, which allows for banishing the dark clouds of nuclear tyranny and ensuring an independent life of the whole of humanity under clear blue skies. The main reason for the current escalation of tensions in the Korean Peninsula is found inside the United States itself, but at the same time a large share of responsibility is born by the countries that voted for the adoption of the “sanction resolution,” cooked by the United States. The government of our republic has numerously stated that any attempts to squeeze our throat and stifle us, which are made under the pretext of fulfilling the so-called ‘sanctions resolution,’ are tantamount to an act of aggression and war and that in response we won’t give up the use of our last resorts. President Putin also acknowledged that the Koreans will never give up nuclear weapons, even if they eat the grass, and stressed that the sanctions and the military hysteria won’t bring anything good. Neighbouring countries mastered nuclear weapons in the last century at the cost of big losses and ordeals to counter US threats and pressure. And if they try today to stand in the forefront of the campaign of sanctions and pressure against us, then by this they will ruin themselves and get into trouble. We are consistently implementing the policy towards the parallel development of the economy and nuclear forces, which was mapped out by the respected supreme leader, and we will successfully conclude the historic cause for improving the national nuclear forces. Along with that, with reliance on the driving force of self-development and scientific and technical potentials, we will achieve a new upsurge in the construction of the socialist economic power, tearing to shreds the hostile policy of sanctions and stifling and turning misfortune into happiness. We hope that TASS news agency will properly understand the sentiment of our people who has arisen for a fair last battle, will tell the world public the entire truth about our country and make a worthy contribution to ensuring regional peace and security and implementing international fairness”. Ri Yong-ho then answered a series of questions from a Tass journalist. 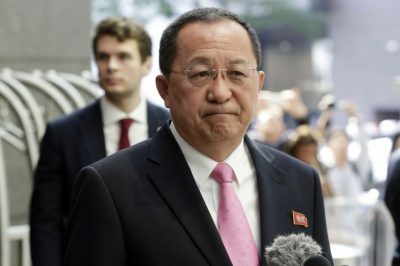 As part of the question and answer session, Ri explained that the only thing holding Pyongyang back from engaging in dialogue with the US and from engaging in Russia’s tripartite economic proposals, is the fact that Pyongyang refuses to negotiate with any party until the US ceases its military threats against the DPRK. This helps clarify a position North Korea expressed during the Eastern Economic Forum where Pyongyang’s representatives at the Vladivostok forum stated that they are interested in Russia’s proposals to engage in cooperation with Seoul and Moscow, but only at a later date and under certain conditions. In the Tass interview, Ri explained that those conditions include the US ceasing to threaten his country, as well as South Korea detaching itself from those threats. In this sense, North Korea has all but formally endorsed the Sino-Russian double-freeze which calls for the US to cease its provocations towards Pyongyang, cease its deliveries of THAAD missiles to South Korea and cease its military drills in the region, all while calling for North Korea to do the same while both sides prepare for direct talks. Ri also explained that unless the US de-militarises its forces in South Korea and ceases its threats to the DPRK, Pyongyang will work to achieve nuclear parity with the United States. This statement can be interpreted in several ways. While the statement’s literal meaning is that North Korea seeks to ostensibly maintain a nuclear force as large as that of the US, this is patently unrealistic. However, what is very realistic is that North Korea could develop nuclear weapons and the appropriate delivery systems to target the US mainland with a similar ease to that which the US could do in respect of delivering a nuclear weapon to the Korean peninsula. By some estimates, such a development is as close as a few months away or as long as over five years away. The fact that no nation actually knows the DPRK’s time-frame, in this respect, is another reason that Russian President Vladimir Putin recently cited as a reason why there is no wisdom in the US or anyone else attacking North Korea. Putin also recently cited North Korea’s unwillingness to ever cave to threats from the US, irrespective of how much the US inflicts damage on North Korean society. “Russia has developed a roadmap for settling problems of the Korean Peninsula. How realistic is the implementation of this proposal at the current stage, in your opinion? We give due to the fact that today Russia, like in the previous years, pays much attention to the problems of the Korean Peninsula and is taking active efforts for their settlement. And we show full understanding for the motives and the goal, under which Russia has developed the roadmap. In our estimates, the current situation, when the USA resorts to the maximum pressure and sanctions and utmost military threats against the DPRK, is not the atmosphere, in which negotiations could be held. In particular, our principled position is that we will never agree to any negotiations, at which our nuclear weapons will become the subject of talks. Under which conditions do you consider it possible to start a dialogue between the DPRK and the USA? As we have stated on numerous occasions, the USA should abandon its hostile policy and give up a nuclear threat against the DPRK with all their sources and roots. What do you think about the policy of the new South Korean authorities towards the DPRK? In his report to the 7th Congress of the Workers’ Party of Korea, respected supreme leader comrade Kim Jong-un clearly outlined the tasks for improving inter-Korean relations. Lately, the South Korean authorities have been proposing to start negotiations between the militaries of the North and the South, organize meetings of divided families, provide humanitarian assistance, etc. However, the problem is that they contradict the principles that “the Korean nation should solve all the issues on its own” and that they blindly follow the US hostile policy towards the DPRK. As long as they resort to sanctions and pressure against us, following the US line, we see no prospect for improving the inter-Korean relations. And for this purpose, it is first of all necessary that the South Korean authorities should halt their humble submission to the USA in its hostile policy and the campaign of sanctions and pressure against the DPRK. It is important that they should change their policy in favour of the pan-national interaction and measures to cut short acts of aggression and interference from outside”. These answers indicate that as Russia and China have suggested, the US remains the largest stumbling bloc to peace in respect of the Korean crisis. North Korea has set its preconditions for direct engagement with the US, South Korea and others. Contrary to what the western mainstream media says about Pyongyang, North Korea’s preconditions are not only reasonable, but are hardly different from those set out in the Sino-Russian double-freeze peace plan. By contrast, Donald Trump has publicly rebuked his Secretary of State, Rex Tillerson, for suggesting that it is wise to keep the door open to negotiations with Pyongyang.